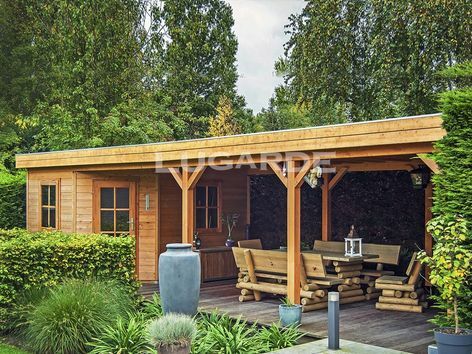 The Lugarde Prima Jacob comprises a pentagonal summerhouse with corner door plus a large open canopy seating area to the side with pine support posts. 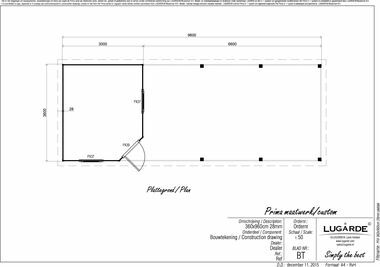 Overall summerhouse size 9.6m x 3.6m in 28 mm log thickness. The standard package includes 1 x PX39 single corner door and 2 x PX37 windows. The flat roof canopy measures 6.6m x 3.6m with 7 x pine posts.